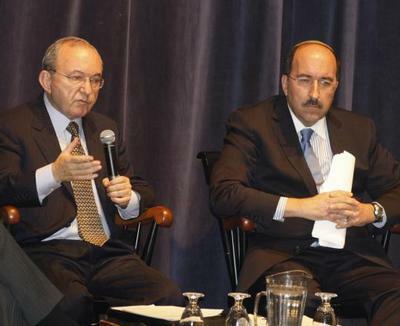 TO BRANDEIS UNIVERSITY LAST NIGHT, South African jurist Richard Goldstone brought his distinguished international reputation as a legal scholar, a human rights advocate, and the former chief prosecutor of the United Nations tribunals for the former Yugoslavia and Rwanda. By contrast, Dore Gold, Israel's former ambassador to the United Nations, brought facts and figures, maps and photographs, and audio and video recordings in English, Arabic, and Hebrew. The two men were at Brandeis to discuss Goldstone's highly controversial UN report on Operation Cast Lead, the Israeli attack in Gaza last winter. The report, written after a fact-finding mission with which Israel refused to cooperate, accuses the Jewish state of committing war crimes by using "disproportionate force" to inflict widespread destruction on Palestinian civilians -- a policy that amounted to "collective punishment on the people of the Gaza Strip." Last night's encounter marked the first time since the report was issued that Goldstone publicly debated the report's merits with a leading Israeli figure. It would not surprise me to learn that he is in no hurry for a second. That is not to say that Goldstone didn't speak well, even eloquently, in defending his own integrity and his chagrin at Israel's refusal to have anything to do with his commission's inquiry. Nor was there any mistaking his sincere outrage when he itemized the physical devastation he viewed in Gaza -- 5,000 homes destroyed, 200 factories disabled, water systems wrecked, poultry farms demolished -- or when he denounced the bombing of a mosque during prayers. "If that isn't collective punishment, what is?" Goldstone asked. Such attacks, he said, "scream out" for investigation by Israel. But Goldstone spent much of the time talking about himself -- he recounted his dealings with the chairman of the UN Human Rights Council, his nightmares about being kidnapped by Hamas, his pleased discovery that ordinary Palestinians were "just like" ordinary Israelis -- while his interlocutor focused relentlessly on facts and evidence. Gold played video of Israelis under Hamas rocket attack, and noted that such attacks had increased 500 percent after Israel's withdrawal from the Gaza Strip. He displayed aerial photographs of Hamas military installations located amid schools and mosques. He described Israel's extraordinary efforts to avoid civilian casualties, and showed Palestinian TV broadcasts confirming those efforts. He presented images of weapons caches inside Gaza mosques and homes. It was a powerful presentation -- so powerful, in fact, that Goldstone regretted not having seen it earlier. "The sort of information shown to us by Ambassador Gold," he said, "should have been shown to us during the [UN] investigation." Yet to my mind, what was most striking of all was Goldstone's inability to give a clear answer to an essential question: What should a law-abiding country do to defend itself against relentless terror attacks? In one form or another, that question came up repeatedly. In his welcoming remarks, Brandeis president Jehuda Reinharz observed that we live in a "new age of warfare," in which civilized nations confront terrorists able to "mix and melt" into the civilian population. Asked Gold, after describing the thousands of rockets launched by Hamas at Israeli communities: "What would you do if your population was facing repeated attacks for eight years?" During the question-and-answer period, a student asked Goldstone -- who had condemned Israel's "disproportionate" attacks -- what he would have considered a "proportionate" response. But the judge, astonishingly, had no answer. He responded that that was a decision for the Israelis to make. He said it was a question that had given him "many sleepless nights." He mused that perhaps undercover "commando attacks" would have been more appropriate. ("Now why didn't the Israelis think of that?" murmured a voice in the audience.) He even suggested that it might make a good subject for a Brandeis research paper. Judge Goldstone uses his international platform to pronounce Israel guilty, in other words, but will not say how Israel could have avoided such a verdict. For the truth is, no other verdict was possible. Where the UN is involved, the guilt of the Jewish state is always taken for granted. The eminence of its chairman notwithstanding, the Goldstone Commission was a sham, and its bottom line was foreordained. The mystery isn't why the Goldstone Report has been so widely denounced, but why Goldstone agreed to write it in the first place.